"Staff there were very helpful and I was allowed to look at as many old A.P. magazines as I wanted and to take photocopies. 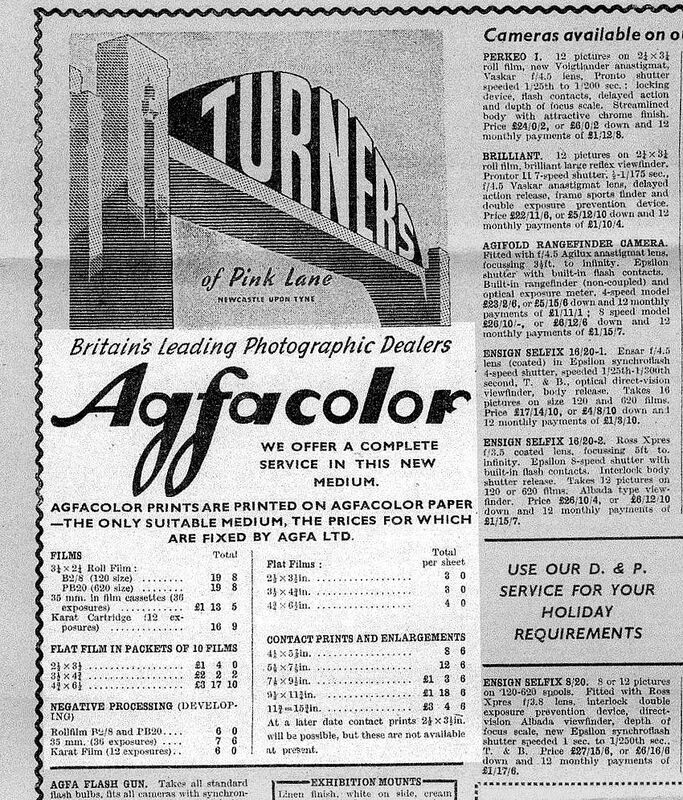 The first Turners advert for Agfacolor is from A.P. magazine dated July 4th 1951. 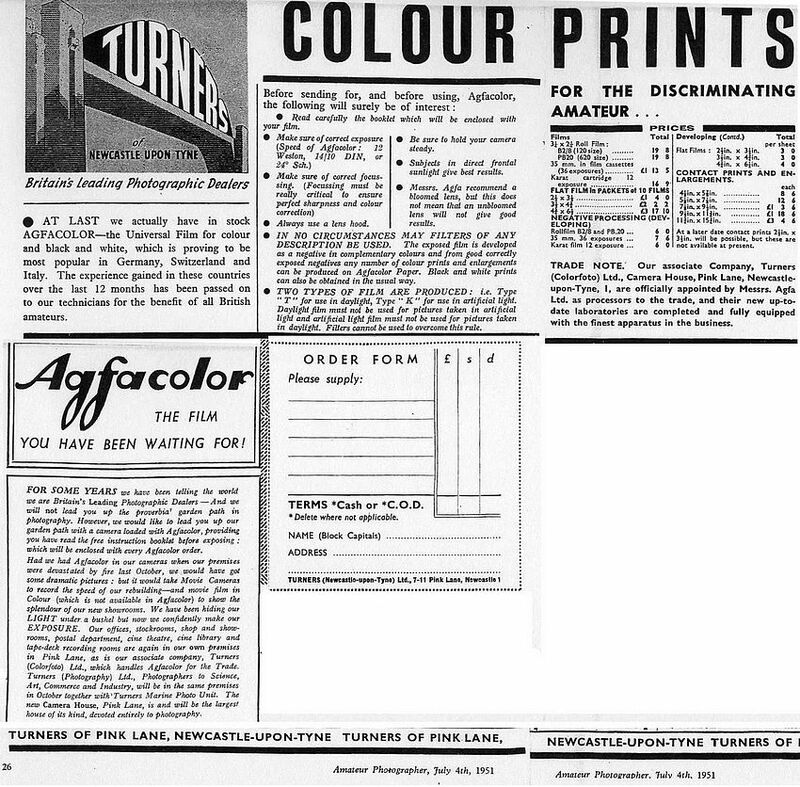 There are no Agfacolor adverts in the previous issue, June 27th 1951 so it could be assumed that the start of Agfacolor processing and printing in the U.K. was the beginning of July 1951". 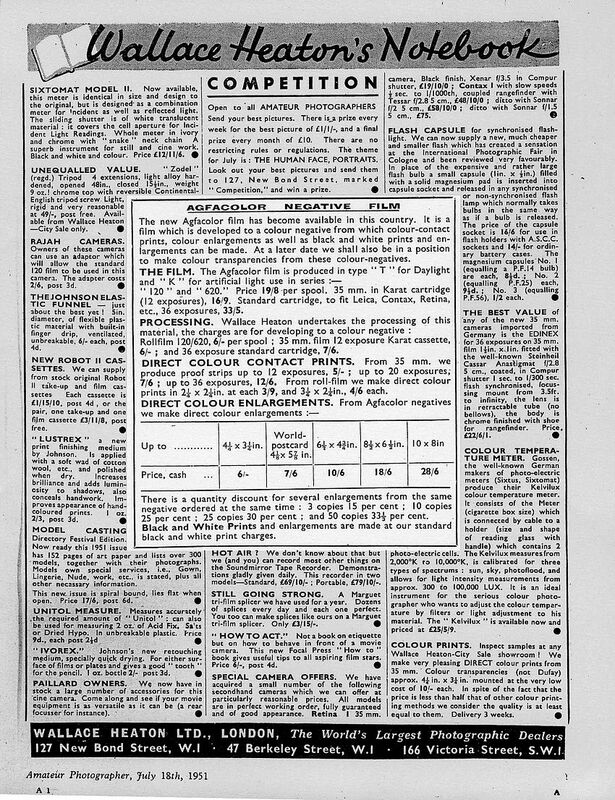 In the May 9th 1951 issue of the Amateur Photographer , Lancelot Vining wrote an interesting article in his column Miniature Camera Gossip. Entitled Colour News, Mr. Vining tells us that Turners were completing a new laboratory exclusively for the purpose of processing and printing the, then new, Agfacolor negative films. He also tells us that a member of Turners" staff had been to Germany and completed a course of instruction there in the use of Agfacolor materials, passed the tests, and been awarded a first class certificate. He is now recruiting a staff to work in the new laboratory. Mr. Vining mentions that Mr. Turner hopes to have his laboratory up and running by the end of June (1951), and a certain Mr. Binns, who Mr. Vining calls Colour Chief, says that everything is ready to start, but if the demand for colour prints is very high, restrictions in obtaining stainless steel might makes things very difficult. At that time, May 1951, there seems to be very little known of the cost of Agfacolor films and the prices of the prints made from them. In his article, Mr. Vining gives a price of 32shillings (£1.60) for a 35mm cassette of 36 exposure Agfacolor negative film. This price would also include the developing charge, and a set of black and white proofs. (Quite a bargain !). He also says, the negatives and proof prints were to be returned to the photographer and the photographer could then decide which negatives he wanted printed by marking the proof prints with cropping lines if he only wanted a certain part of the negative enlarged. Mr. Vining quotes 7shillings & 6d, (37p) for a colour print sized 7inches by 9inches. 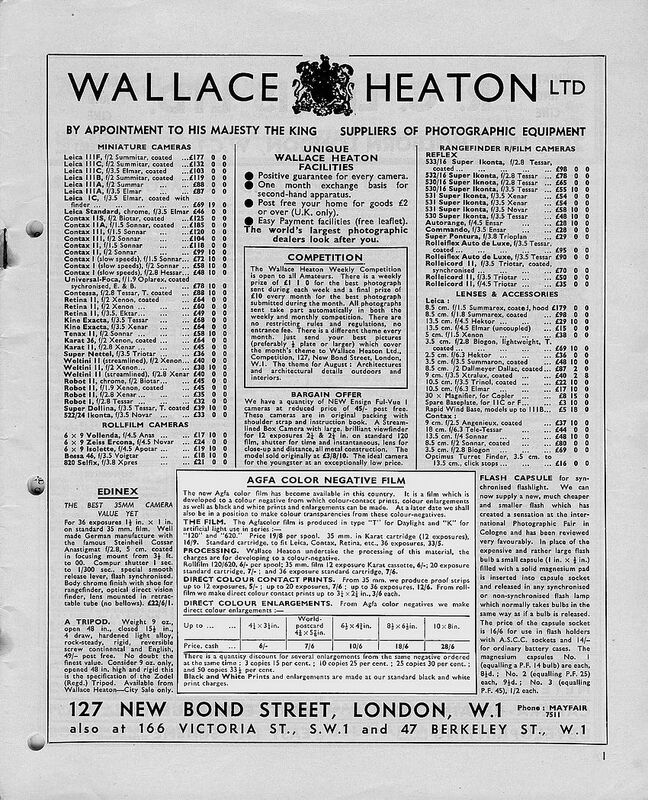 When the prints were returned to the photographer a technical data sheet was to be enclosed giving details of the filtrations used to make the prints. Then if any reprints were required, the data sheet could be returned to the laboratory with the negatives. Later, the Amateur Photographer magazine for June 13th, 1951, published a letter in their Readers View column from Agfa Limited. 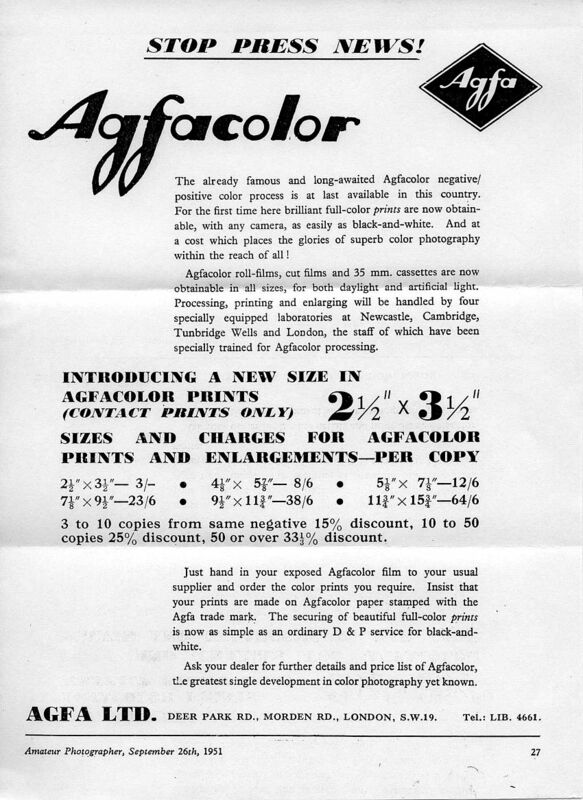 "Agfa hoped that Agfacolor negative films would be available for sale in June, 1951 in rollfilm, 35 mm film, and Karat 12 exposure sizes. 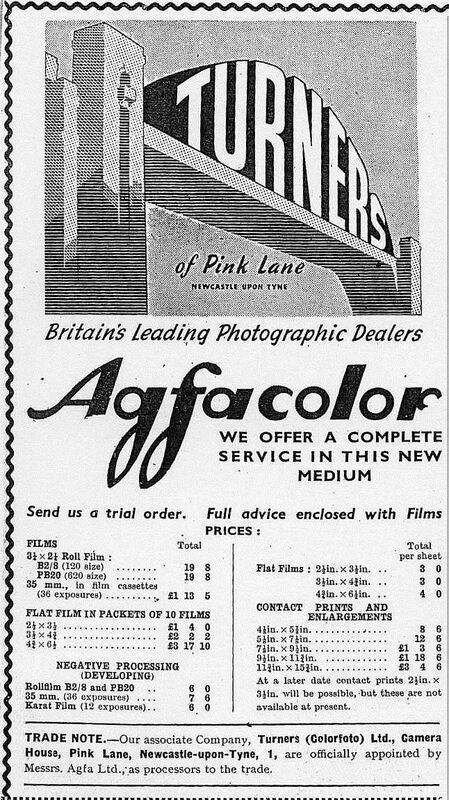 Agfa also listed the four companies in the U.K. who were to process and print Agfacolor negative films. 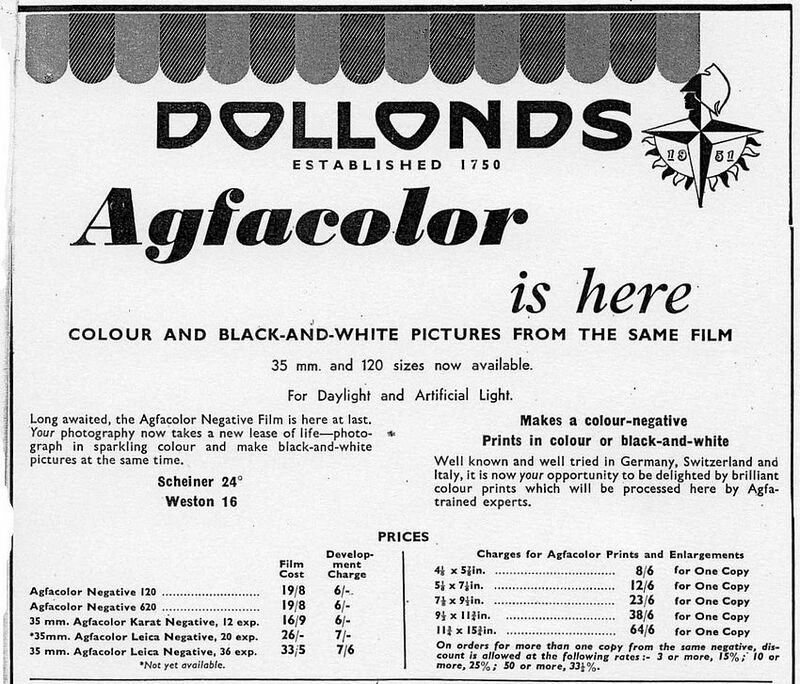 An Agfacolor 35mm 36 exposure negative film would cost more than 32 shillings, (£1.60), and this price would not include the processing charge and would definitely not include any proof prints, black and white or colour. 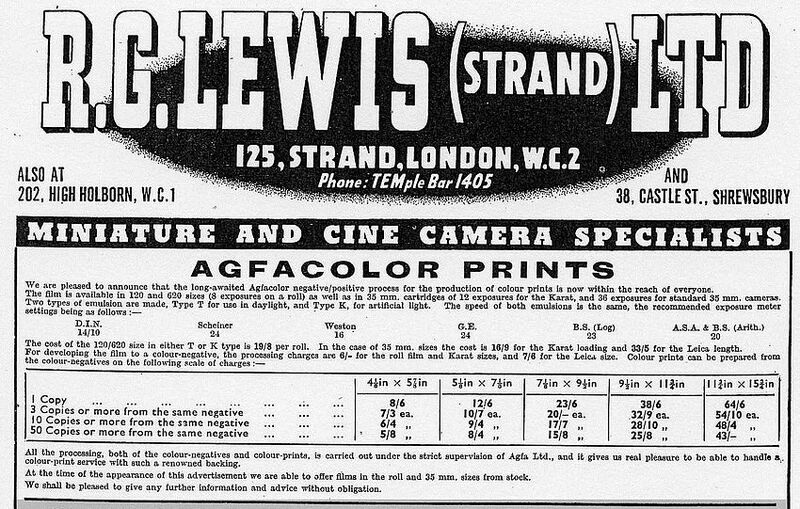 Agfa also stated that the prices of colour enlargements had not yet been decided upon, but it was reckoned that a colour enlargement of 4&1/8inches by 5&7/8 inches would cost 8shillings and 6d (42p). The letter was signed: Agfa Limited, E.R. Napthine. The editor of the Amateur Photographer pointed out at the end of the letter, that Mr. Vining was given the prices by the head of the colour section of one of the four companies mentioned in the letter with complete authorization to publish them. 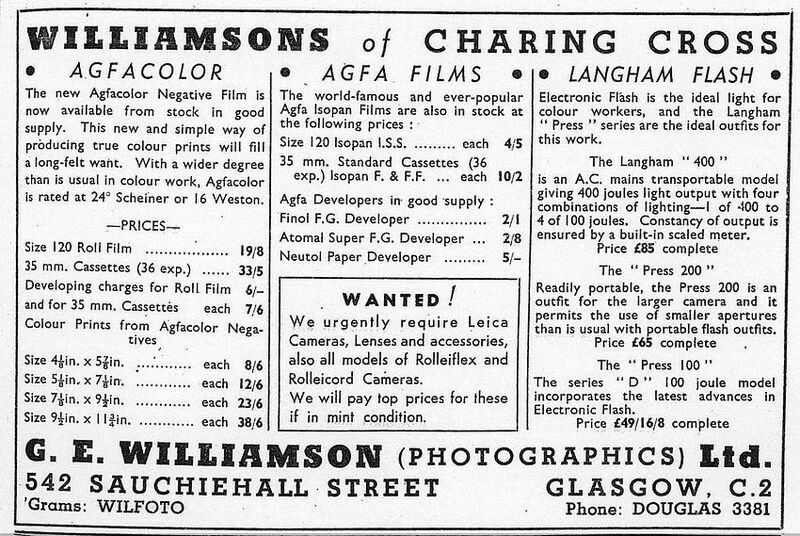 In July 1951, the cost of a 36 exposure 35mm Agfacolor film was 33shillings & 5d (£1-13s-5d = £!-67p). A colour print, size 7&1/8inches by 9½inches was priced at 23shillings & 6d (£1-3s-6d = £1-17p). 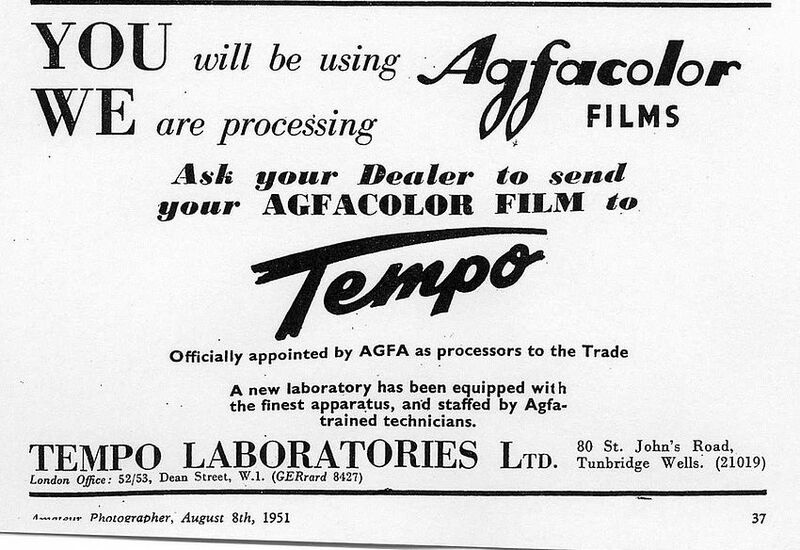 At that time, prices of the film processing and of the colour enlargements were fixed by Agfa. 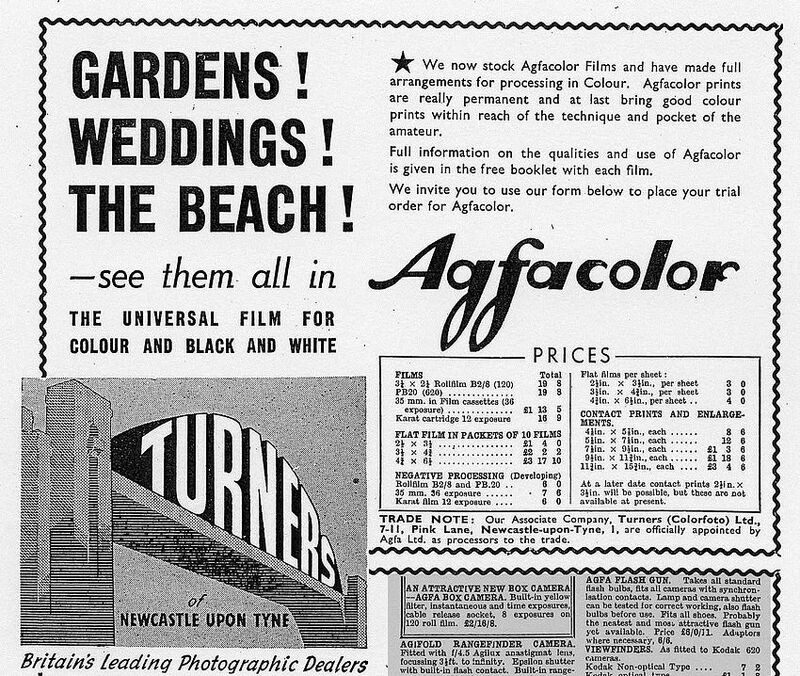 (See below; Turners earliest Agfacolor advert from the Amateur Photographer for July 4th 1951). This was originally a double page advertisement which has been cropped (below) for the sake of clarity. 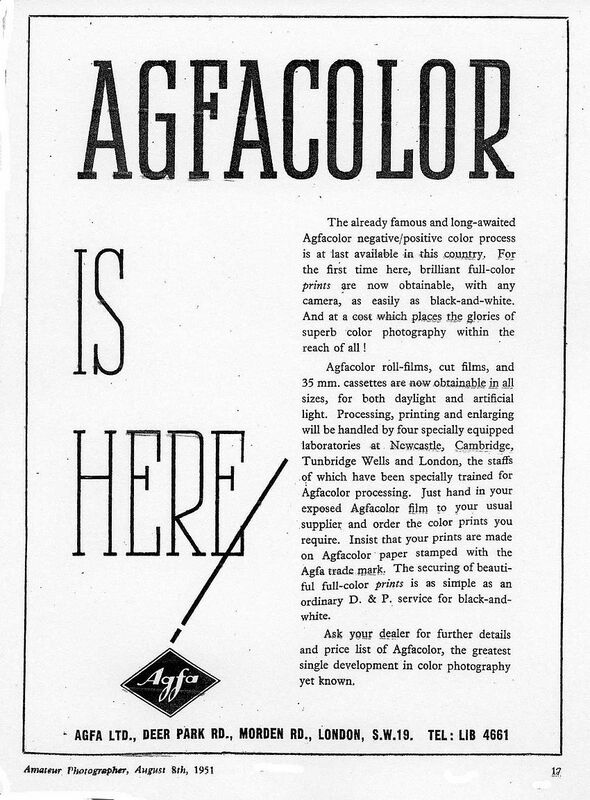 Michael Talbert comments that this advert is the earliest Agfacolor announcement he could find with details of the new printing services. 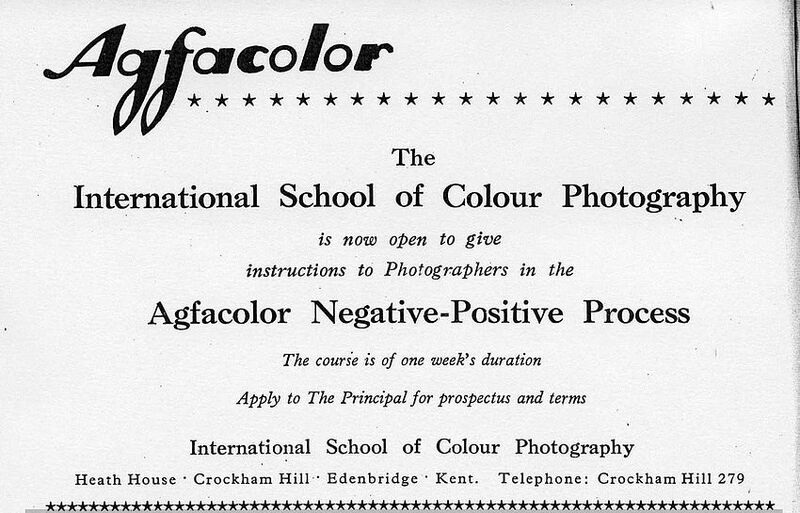 Michael Talbert comments that this is a rare advertisement for the International School of Colour Photography, which became "Colour Processing Laboratories" (CPL, where Michael Talbert worked). Heath House was the address where the original lab. was situated, but it later moved to Fircroft Way, Edenbridge, in either 1967 or 1968.